SnapShots is a QNotes Productivity Module that can be added to the QNotes Office Solution. SnapShots is available for purchase with a Miscrosoft WebCam, or you can use your own digital camera or web camera. 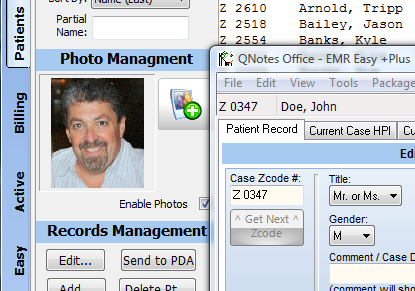 We created SnapShots as a tool to snap a picture of your patient at the front desk. Then this photo, saved as a jpeg file, can be inserted or "dragged" into the patient record. You may ask, "Why do I need a picture of my patient?" Well the idea originated as a tool for our clients with a large "snowbird" population. Patients come and go, and this photo module helped the staff remember their patients! With SnapShots, you can maintain a photo of your patient (or anything else for that matter) in the Patient List screen, as well as in a specific patient's Demographics screen. Add SnapShots to your QNotes Office for only $169.00 including a WebCam!